The Peloponnese at all unfairly classified by historians and medievalist of the last centuries, as the place with the most across Greece castles. And many of them, mainly because of the great strongholds position had the chance to save up our days, to some extent at least. 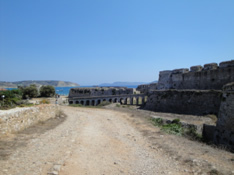 The fort of Pylos (Niokastro) began to be built by the Ottomans in 1573, shortly after their defeat at the Battle of Lepanto (157One). 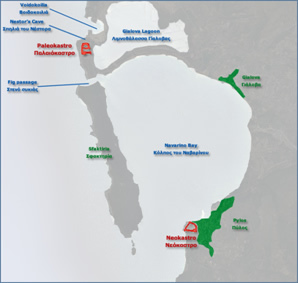 The purpose of its construction was the control of the southern entrance to the bay of Navarino, since now the north access (Strait Sykias or Faltsa Buka) and there harbor, lagoon area Divari Rivari or could not be used due to silting. Named “Niokastro” as opposed to the earlier fortress Kyryfasiou (Paliokastro or Old Navarino), which controlled the northern entrance to the old port. Since then Niokastro followed the common fate of the remaining strongholds of the area involved in the historical events that marked the place. Remained in possession of the Turks until 1686, when he surrendered to the Venetians. 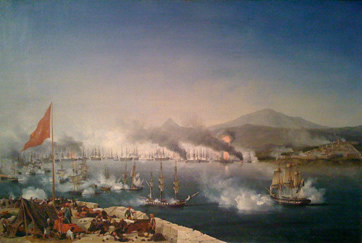 The 1715 Turks recaptured Niokastro with Koroni and Palionavarino. In 1816, Ibrahim Pasha became the lord of the castle until 1828 when it was liberated by the French general Maison. 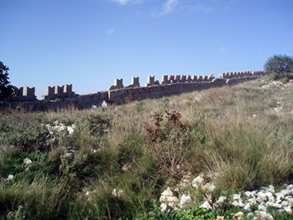 After the liberation of Greece (during the Second World War), the fort was used for some time as a prison before finally ascribed to the Archaeological Service. Thus, there are considerable damage to the monument, repairs, alterations and additions. The idea for the establishment of “centers” is due to the then Superintendent of Underwater Antiquities George Papathanasopoulos. Thanks to concerted efforts in the spring of 1982 was the launch of projects with funds available to the Ministry of Finance through the Archaeological Society. Since 1991 expenditure is covered by funds managed by a special body of the Ministry of Culture. The focus of work rehabilitation and new use of the premises focuses on the acropolis where former prison cells formed in offices, warehouses, work and some of them, in the form of open canopy covers Semihypaethral exhibition needs. Equally, the gunpowder was conference or exhibition. Already in 1984 Niokastro held the 3rd International Conference on Underwater Archaeology and since then has covered the needs of several spiritual events in the region. In the recent past almost completed and the restoration of the eastern cylindrical bastion bearing according to popular tradition, the name of General Makriyannis, aimed at reforming into a permanent indoor exhibit space. Under the building program of the “center” was restored from imiereipomeni situation that had fallen and the building of the barracks of the French expeditionary force for the period 1827-1830. Defined as “Barracks Maizonos” from the name of the chief French general. The floor of the “Barracks” stood library for the needs of “Centre” which also hosts the donation “Messinian” library publisher Noti boat. Includes additional accommodation space – a short stay or scientific researchers and other staff. The ground floor was meant for the exhibition of the collection of French philhellene Rene Ruaux, which according to his wish, should be housed in Pylos. Most of the hosted between 1961-1984 in “Antonopouleion” Archaeological Museum and then taken for conservation and exhibition. The remaining portion, kept from 1936 to Greek pavilion campus Dame, transferred in 1986 to the National Gallery with care Listen. G. Papathanasopoulos and was delivered in 1992 in Department of Underwater Antiquities in order to lead to the final destination. 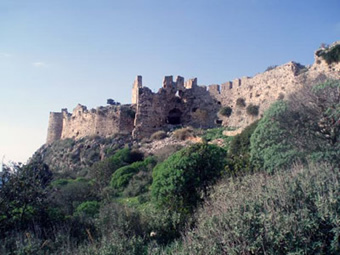 The powerful French origin megalovaronos crusader Nicholas II de Saint Omer, so called from the Greek population “Santameri” and “Geronikolas” was the one who built this castle, which we know today as Paleocastro Old Navarino Pylos. Who was this Santameri? Let’s answer immediately: the Nicholas II was on Frankish second highest lord of Thebes. There his father, the first lord of the town Trouble de Saint Omer had built from the wealth of his wife Princess Mary (daughter of the King of Antioch and Tripoli Voimoundou VI), one of the most renowned and most beautiful castles of the era, which christened with the name of the founder of the wealthy. For this castle, or rather what remains to this day from that, we’ll talk in more detail another time, when I wander. The Trouble dies, Nicholas inherited the barony. After many years and after his first wife dies, the great lord (called “Geronikolas” anymore due to age) marries widow mega Prince William Villehardouin of Achaia, Anna Angelina Komnenos automatically becomes the owner of several possessions in the Peloponnese.One of those acquisitions was the place where had decided to base his castle “Old Navarino.” And he did with characteristic masonry of the Crusader castles with turrets angelokamotes finely shaped «v» that bring sweets in mind each traveled the famous castle of the Knights of Rhodes. So then, the castle after the death of Geronicola, comes to ownership of nephew Nicholas III, protostrator of Achaia, but the fate liked a known history of all Greek Kastelas. In 1381 the overwhelms the Spanish company of Nafarraion, after half a century, the Venetians, after the Turks and so on. Perhaps no accident, since knowingly is that in ancient times at the time of Homer, Nestor who was taking participation in the war against the Centaurs and Lapiths, the Argonauts, the Trojan war and other mythical and non-major events, was king of Pylos. The cave has its legend and with this we will close this tour: According to ancient tradition in the dark of the room, the cunning god Hermes-young when I was still-led fifty cows which had stolen Olympus by Apollo. When he realized this he turned the world upside down to discover them. And when they found her, grabbed trickster zooklefti and led him to the father of the gods Zeus to pay the offense. To save Mercury punishment, took a lyre which previously had made and started playing in order to enchant enraged Apollo to end the misunderstanding. And it did, indeed, winning the herd, so why was enchanted by his playing the luminary of the gods exchanged fifty live once guarded with his lyre.